and the south-east coast of Australia. 3900nm, 4500mi, 7000km. May '09. This time I've loaded the photos into a Picassa Web Album. This should give higher quality and less load on the website. I’d been to Lake Eyre several times when it was dry (even landed on it once), but this year the water did reach the lake, so I just had to see it, and it was well worth the effort! As you can see from previous flights, Channel Country and Water Everywhere, I have a fascination for the inland river systems that feed Lake Eyre. It’s an enormous catchment area, and is unusual because there is no outlet to the sea. Most of the time these rivers are totally dry, and wouldn’t even be called ‘rivers’ in most countries. But when the tropical ‘wet’ season does it’s stuff they can become a flood. This year was a good one and the floods came down. The Thompson and Barcoo Rivers join to become Cooper Creek, the only place in the world I know of where two rivers become a creek. But this ‘creek’ is 70km wide! It forms a myriad of small channels that are perfectly levelled so that the water spreads out evenly and soaks into the ground. It’s a perfect natural irrigation system! Most years there’s only enough water comes down the rivers to feed this ‘channel country’, but this year there was enough to flow on to Lake Eyre as well, so I had see it. Then as long as I was halfway there I might as well go on to the Nullarbor Plain, eh.... That’s another part of Australia that I find fascinating. 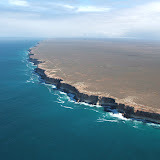 I’d been across the inland part of the Nullarbor before, along the rail line, Coast to Coast by Rans S7, but this time I wanted to explore the cliffs along the ocean – spectacular! I mostly prefer to go inland, but this time I decided to follow the coastline all the way back home to Queensland. What a coastline! - beaches, beaches, rocky headlands, beaches, beaches and more beaches.... I’ve now seen enough beaches to last a lifetime..... The surprises that I found, were the large amount of cropping agriculture right to the dunes in South Australia, and the vast wilderness area along the south east coast of NSW. There’s a VFR lane past Sydney called Victor 1, below 500ft just off the coast. Gives great views of all the expensive houses perched on the cliffs, the famous beaches, and a glimpse of Sydney Harbour with the bridge in the distance. What a contrast to those uninhabited cliffs along the Nullarbor! This time I had a laptop on NextG wireless, and it was really valuable. It was really good to be able to watch the movement of weather systems on the foreward forecasts and arrange my movements to avoid them. Far better than other trips when I used to try to catch tomorrow’s weather on the TV in a noisy pub...... When I saw a raging south-west front was approaching Melbourne I flew over to the Goulburn Valley and visited those Savannah fliers until the weather blew through. Later I was able to avoid flying into all that wild weather in northern NSW by pausing at Mallacoota and Merimbula for a couple of days and then diverting inland for a day to visit friends at Cowra. Despite persistent complaints about weather forecasting, I find the present bureau of meteorology forecasting to be really accurate and informative, especially as regards to the movements of the major systems. Handheld computers are getting smaller and lighter, and NextG coverage is getting pretty good, so I think it’s well worthwhile. I’m not yet set up to log on while flying, but will be next time, cause you get really good range at altitude. Imagine, airborne weather radar in an ultralight! The other innovation that I had this time was a bicycle on board. Most country airfields are just too far from town to be a comfortable walk. Even when you do get to town you can’t explore much on foot. For many years I’ve wanted to carry a bicycle in my aircraft while travelling around. Well, now I finally have that capability, and this was the first trip to try it out. I was able to ride into several towns to get a meal and a beer and bring back unleaded fuel, and to ride around to see the sights and explore a bit. The exercise is really welcome after sitting all day.... It’s just great! The photos will show that the modification I did is a bit complicated for most owners, but well worth the effort to me. In the past I had even bought a Rans S7 especially for this purpose, because the rear seat area in such a tandem aircraft makes it easy to carry a folding bike. But when I figured out how to convert this Savannah, it was the winner. It only takes minutes to load/unload the bike, and it’s completely out of the way, leaving room for a passenger. The conversion weighs 6kg, and the bike 12kg. To balance the CofG I moved the battery from behind the main gear to the firewall. And I carry my survival 3 litres of water on the floor forward of the passenger when the bike is on board, and move it to the bike compartment when the bike isn’t there. This keeps it right in trim at all loads. The more aerodynamic lines of the new top deck actually cleans up the airflow a bit. I travel pretty light as regards camping and personal baggage, so the extra load of the bike is still well within limits. I’ve changed to large, heavy duty tyres on this aircraft. They add 7kg to the weight, but make it possible to land off-field in some of the rough places that I enjoy exploring. Surprisingly only cost 1 knot in cruise speed, checked by 4-way GPS, which was made up by the better aerodynamics of that new top deck. I’ve also installed extra fuel tanks. Now I have an endurance of 8+ hrs and have found that to be very useful. Everyone says, “....but my bladder wouldn’t holdout...”, but that’s not the point. I can now fill up and then stop here and there at little airfields without fuel or exploring off-field, and still have wide options for changes to plans and alternatives without being limited by fuel. On these x-country trips I fly solo, so can carry the full fuel load, plus bike and light baggage without being overweight. 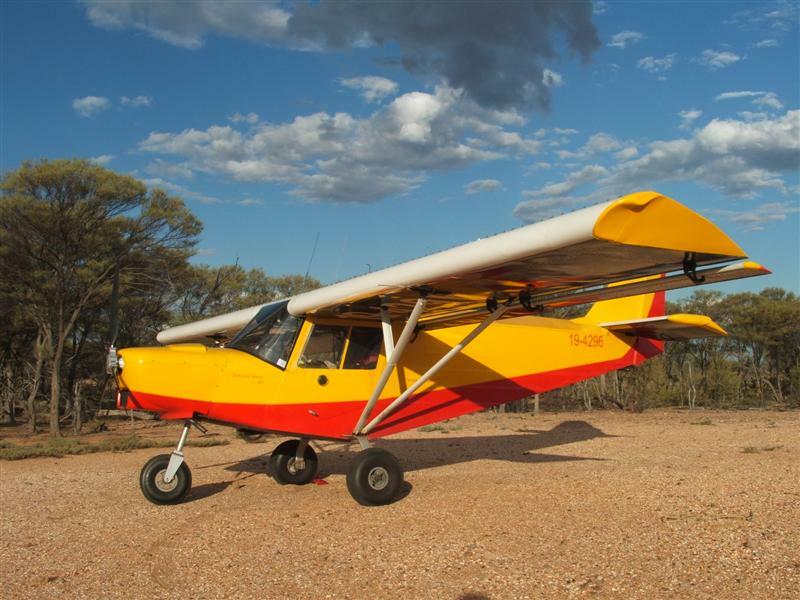 All in all, this aircraft is now about as ideal for outback travel as I can imagine. Let’s go!! !